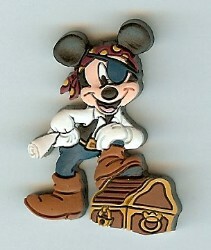 This pin could be purchased at the Pirates of the Caribbean ride at Walt Disney World. It is made of rubber and is 3D. 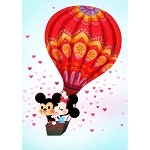 Mickey Mouse is dressed as a pirate with a bandana, eyepatch, white shirt, vest, and boots. He is holding a map in his right hand and his left foot is on top of a locked treasure chest.